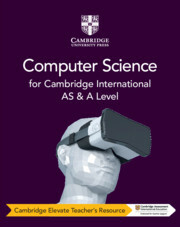 Developed by an experienced author and examiner team, this teacher’s resource accompanies the coursebook and is written for the Cambridge International AS & A Level Computer Science syllabus (9608). It includes chapter-by-chapter support and guidance that will save you valuable time when planning lessons. This resource also contains answers to the coursebook questions. If you wish to buy this resource, we will email you a book code - please contact your sales consultant or customer services. Full lesson plans with associated notes save you valuable time. Advice on how to tackle common mistakes and misconceptions helps you prepare students. Printable worksheets including extension activities give you readymade lessons materials. A bibliography for further reading. 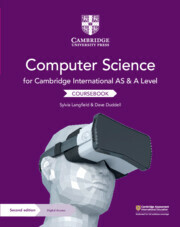 Answers to the coursebook questions help you mark quickly and confidently.